This was a quick outfit taken just after Christmas (so probably looking decidedly pudgier in these photos!). I took these the day after I died my hair all-over dark brown again to get rid of my home job dip dye that I'd grown bored of, as is pretty much always the case with my hair! I've actually just bought a voucher for a cut and colour at Adee Phelan who I wanted to try for some time. My bleached ends are starting to come through the brown dye so I think it's definitely due- anyone else had this problem? So yeah, looking to change up my look a bit- any suggestions? I quite fancied a full fringe but everyone I know has strongly contested the idea! The dolls at Voodoo Vixen offered me the chance to choose an item to style up and review and while a lot of their clothing isn't necessarily my usual style (lots of lovely 50s-style vintage looks), I thought this grey argyle cardigan was really cool. Love a good Mexican skull so the detail on the shoulders really stood out to me. The quality of this cardi is great too for the price (around £30). 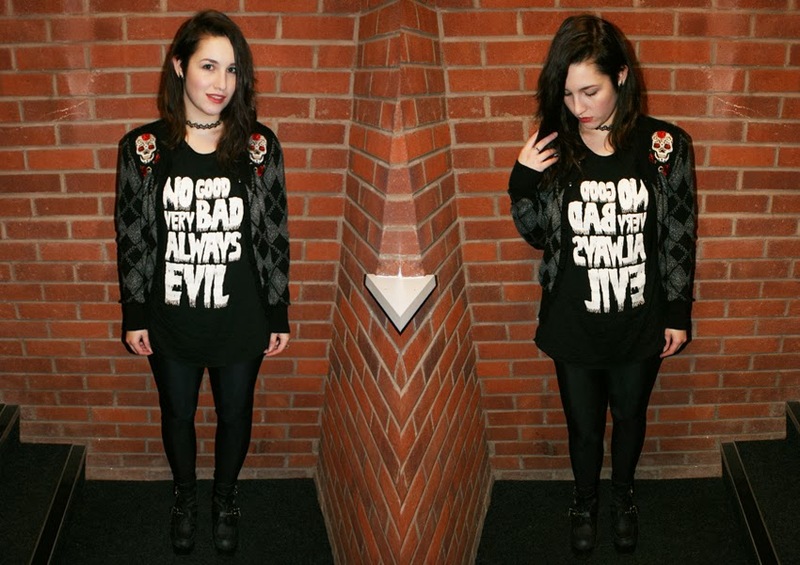 Also wearing my new Evil Twin top I got in a bit of an ASOS sale spree. It's a nice oversize fit and has rarely been off my back at the weekends. Do you remember when these chokers were all the rage? I used to wear them all the time as a moody teen. I had loads; including a set comprising of a neck choker, bracelet and ring in rainbow colours! Have you bought anything good in the sales this month? I've got an ultimate sale purch to show you soon! cool look! i havent bought anything this month but I have been drooling over one of river island's booties, maybe i will break and buy soon mm.